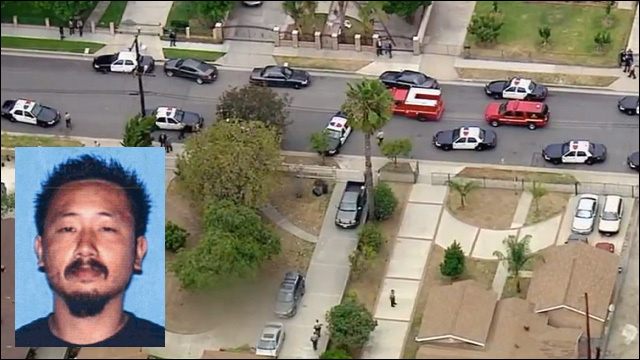 32-year-old Thong Kien Ma was shot by deputies after stabbing his neighbor. Damn. News of a police-involved shooting in Southern California... This week in South El Monte, police shot and killed a man who attacked his neighbor with a meat cleaver. The suspect was apparently high on drugs. Los Angeles County sheriff's deputies shot 32-year-old Thong Kien Ma, who fatally stabbed his neighbor, 59-year-old Chau Da Ngo. He also attacked Ngo's wife, who was injured with a head wound. Authorities were called to the scene on Tuesday afternoon and reportedly saw Ma stabbing Ngo in the yard. They ordered him to put down the meat cleaver, but he refused. The incident was reported about 12:30 p.m. in the 10400 block of Enloe Street, according to Lt. Victor Lewandowski of the Los Angeles County Sheriff’s Department. When deputies arrived, they found a man stabbing another man and told him to stop, Lewandowski said. The man allegedly refused to comply with orders to drop the weapon, and began coming toward deputies, prompting them to open fire, according to Lewandowski. Both the attacker and the man who was being stabbed were pronounced dead at the scene. According to the sheriff's department, it's possible that Ma had been awake since Saturday, high on meth. The motive for the attack was not immediately known, but investigators say it's possible Ma believed his neighbors were stealing his wi-fi connection. Anyone with information about the incident is asked to contact the Los Angeles County Sheriff's Department's Homicide Bureau at (323) 890-5500.